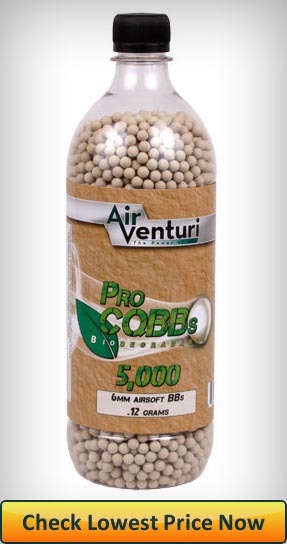 Air Venturi Pro CQBBs are the best biodegradable 0.12g BBs you’re likely to find on the market today. Taking between 3 and 12 months to completely biodegrade, they are the clear choice for any environmentally orientated airsoft player sporting a low powered airsoft gun in the 250-280 FPS range. As with any homogeneous resin-based biodegradable airsoft ammunition, the occasional pellet breakage is to be expected. Air Venturi’s product is no different in that regard. However, their incredibly convincing plastic feel and appearance, an achievement in biodegradable ammunition engineering, is a clear indicator of superiority over the competition. Air Venturi’s Holland based bio research labs have come up with overall impressive 0.12g Biodegradable CQBBs that deliver exactly what they promise. I pride myself with the integrity I keep and protect on this little site of mine. With so many buzzwords, false promises and misleading advertisements flying around in the world of airsoft, I believe honesty goes a long way. 0.12g biodegradable BBs are an airsoft category with the single least amount of high quality products offered for sale. Let me explain. These BBs are used predominantly by low powered, cheap airsoft guns. If your gun is even close to average – you would use 0.20g BBs. And who owns most low powered, safe and not-so-scary guns? Kids! You would think that there is huge demand for 0.12g BBs from kids who have just received their first springer pistol under the christmas tree, right? Right! You would think that competition is fierce, products are ever-evolving and manufacturers are fighting each other for a share of the market, right? Wrong! Manufacturers are fully aware that 11 year old Jacob just wants to have some fun with his buddies and create his own “real life” Call of Duty missions. They know very well just how little he cares about maintaining his $50 airsoft springer. They know he cares even less about the airsoft ammunition he uses. Jacob doesn’t care about seams. He doesn’t care about pellet deformities either. He doesn’t care about biodegradability. Jacob is blessed with the wonderful curiosity and care-free attitude of boys and girls his age. And they know. While awesome for Jacob (I envy him! ), the consequences are not so awesome for his parents and me. It’s far from awesome for you. We actually do care. We care, but nobody is listening. Like it or not, manufacturers prioritize Jacobs satisfaction over ours. He is the market, not us. When Jacob is satisfied with so little (bless him) – we have to make do with what’s offered. Add to this the inherent structural integrity issues some biodegradable BBs suffer, due to their homogeneous resin based makeup, and we got a real challenge on our hands in finding a high quality product. …is to read every word on this page. I’ve taken the challenge on and do believe I have found the best option – Air Venturi BBs. Do they compare to high quality 0.25g BBs? No. They are, however, some of the best 0.12g BBs I’ve used, however, and their biodegradability is up there. If you’re dead set on 0.12g bio BBs – look no further. 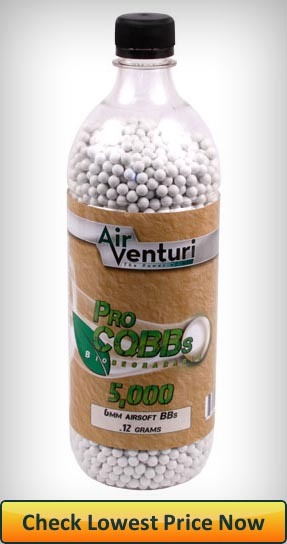 Air Venturi’s 0.12g Biodegradable BBs are entry level 100% environmentally friendly airsoft pellets. Their resin-based makeup allows for efficient and residue free biodegradability in relative short periods of time. Manufactured in Seoul, South Korea, the BBs are white in color and come in compact watter bottles, which helps keep the price down. The BBs are well polished and exceptionally smooth to the touch. They have a mean diameter of 5.928mm and a mean weight of just around 0.125g. Air Venturi BBs are manufactured to fit and perform best in low-powered airsoft guns that don’t exceed 300 FPS. Next to accuracy, arguably the most important factor to consider – just how biodegradable are Air Venturi’s BBs? Air Venturi BBs, like all environmentally friendly airsoft ammo, are made up of a homogeneous resin based center coated in a thin plastic layer. The biodegrading process starts immediately after the bottle is opened and the pellets are exposed to air. The length of the process is heavily dependent on factors, largely out of your control. To give a range, they should biodegrade within 12 months in most cases and somewhere around 3 months if under perfect biodegrading conditions; harsh weather , rain, heat, pressure, surrounded by soil rich of minerals. Very impressive for o.12g BBs. I have hundreds of so called “premium” brands’ bio BBs in my backyard that have yet to show even a hint of breaking down. The biggest surprise, by far, is just how “real” Air Venturi’s BBs look and feel. I was genuinely worried they had poured in the wrong pellets into my ammo bottle. Usually I can distinguish bio BBs from plastic BBs, having played airsoft for so many years. Not with these ones. It was impossible. A genuine surprise, that is a strong indicator of quality, attention to detail and desire to create an awesome product. Not without their faults, after closer inspection it was very apparent that all BBs have seams. This is not unusual for 0.12g BBs and by far not a deal-breaker, yet still – an indicator of cheaper manufacturing methods. Seams increase the risk gun jams, something we would like to avoid as much as possible. Fortunately, I didn’t find any pellets with dimples,bubbles or deformities. No weird shaped BBs either. I should note that this could have been pure chance. Finding a few Frankenstein BBs in every batch is not all that uncommon. This is where it gets interesting. I was surprised to find out that Air Venturi’s CQBBs are actually just a tad bid heaver than the advertised 0.12g. I estimate them to be between 0.125 and 0.13g at the heaviest. Does such a small deviation matter? It depends. The slight increase in weight translates into a better fit for pistols shooting at more than 250 FPS and less than 280 FPS. I expect an average performance boost of 3-5% for guns in the 250-280 FPS range. I still hold the opinion that anything shooting around 280 and approaching 300 FPS should just stay away from 0.12g BBs and go up in weight. 0.12g bio ammo is not the poster child of accuracy and reliability at longer ranges. We all know that by now. Sharing Crosman’s 0.12g Standard BBs‘ traits, outdoor accuracy will be adversely affected from even slight breezes. Indoors, Air Venturi’s are surprisingly reliable at ranges up to 100 feet if shot using guns operating in that sweet spot 250-280 FPS. Use guns more powerful than that and you start getting into unpredictable territory when it comes to pellet flight trajectory. Then again, if you have a more powerful gun, you really shouldn’t be reading a 0.12g BB review. While I wouldn’t say they are expensive, Air Venturi 0.12g BBs aren’t cheap either. Their lowest prices are comparable to similar biodegradable BBs of the 0.20g weight class. Are they worth the money? If 0.20g pellets are too heavy for your lower power airsoft gun and 0.12g BBs is what you’re seeking – absolutely. You’re very very unlikely to find any better 0.12g bio ammo. The king among fools. Air Venturi 0.12g Biodegradable CQBBs, while not without their shortcomings, have exceeded expectations again and again. Reigning victorious over their very few viable competitors, they are the only choice for anyone in need of biodegradable 0.12g ammunition. Have you used Air Venturi BBs? Yes? Great! Let me know what your impressions have been in the comments below. Otherwise, make sure to leave a comment with any questions or concerns you may have. I’ll make sure to take care of you as soon as I can.